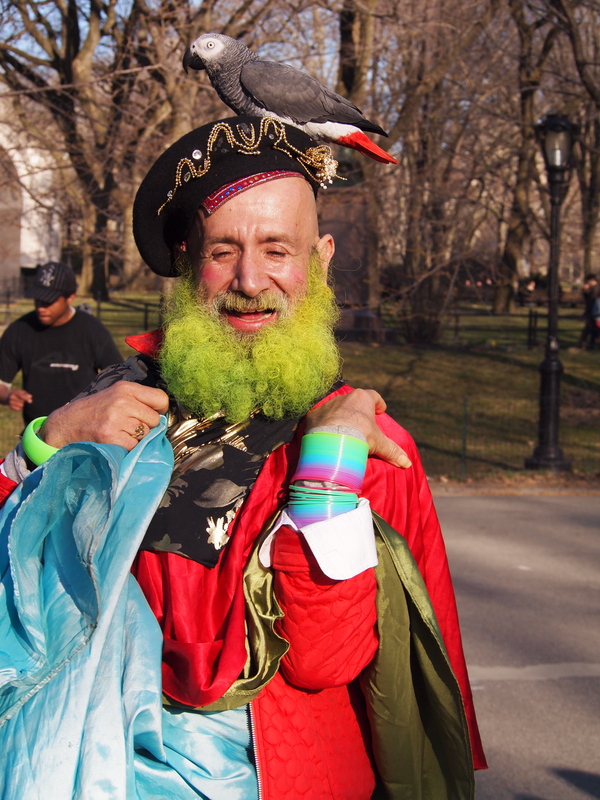 Central Park has been showing signs of spring for some time now. Bulbs have been pushing up through snow and then dry grass since early March, a few tree blossoms began tentatively budding last week and the lawns and playing fields were opened for the season over the weekend. 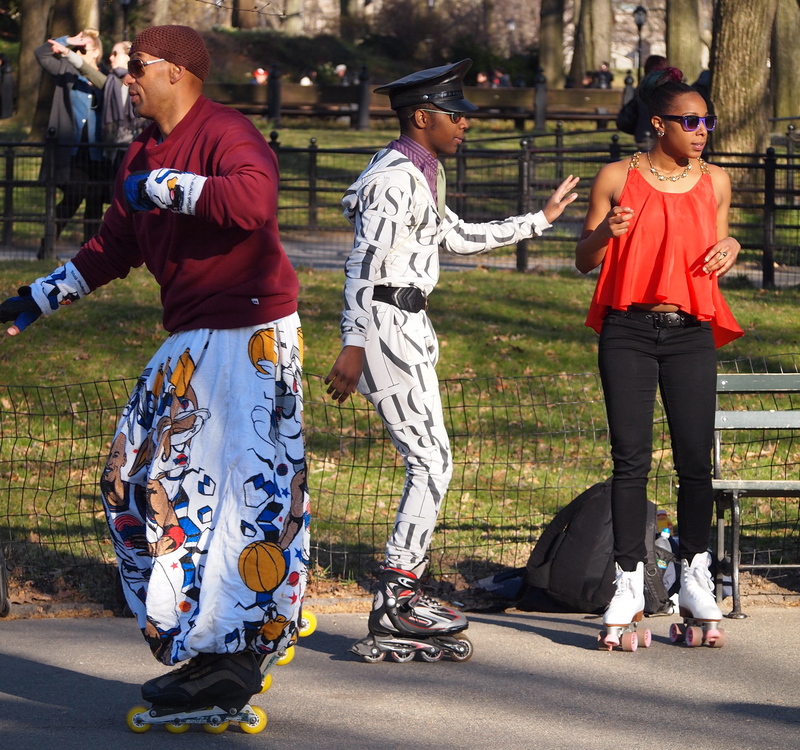 Whatever nature says, spring in the park isn’t official until the Central Park Dance Skaters Association roll up for its first dance of the season. 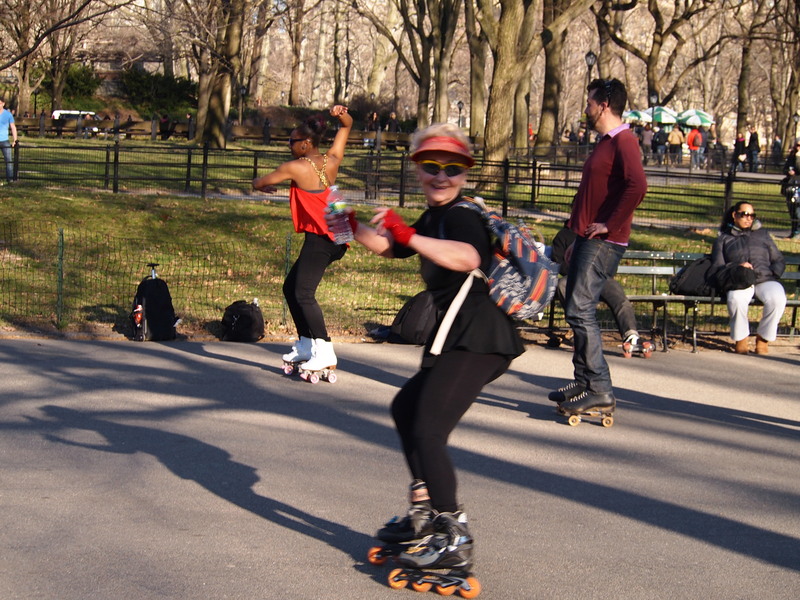 On Saturday, around 40 skaters, 20 or so dancers, a dj and a crowd of toe-tapping spectators welcomed the season in true New York style. And now, spring has sprung! And the fashion. A sight for sore eyes after being shrouded in grey puffer coats for five months. It was about limbering up and getting back into the swing of things. “It’s always been about having fun,” club president Rob Nichols said, as he stopped by to check that everyone was. He was keeping a hawk’s eye on the dj, the hula-hoopers just outside the barricade who come to share the music and work on their own routines. 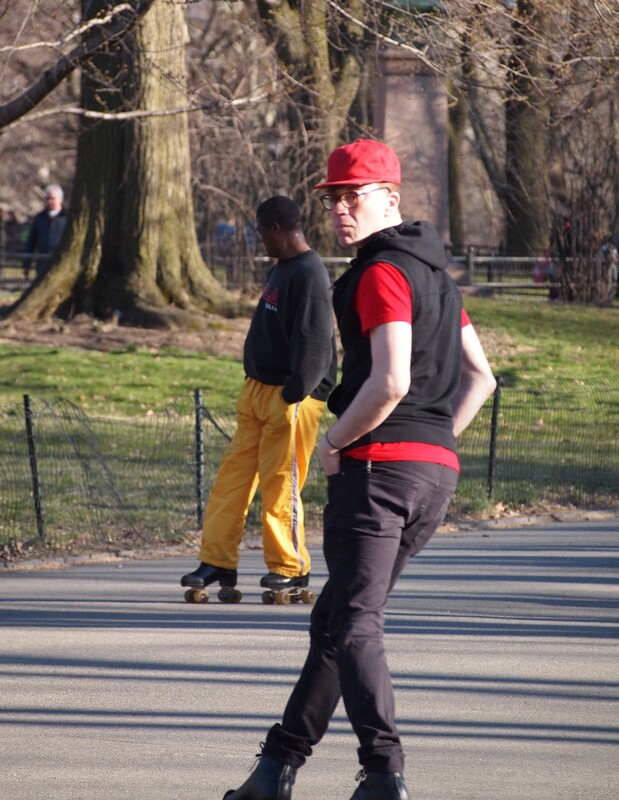 He was ensuring that spectators didn’t walk through and break anyone’s stride and that the one-person parade he dubs “Chiquita Banana” didn’t get in the skaters’ way. According to Rob, going with the flow takes some scheduling. 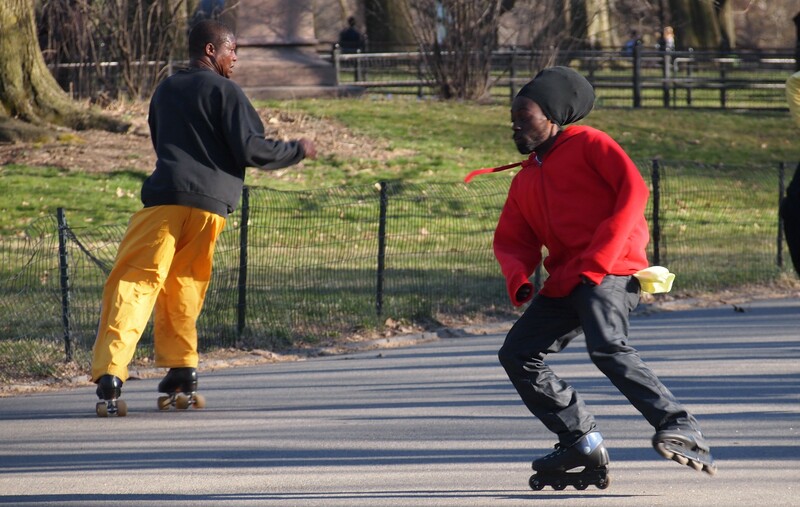 Skaters have been dancing in the park long before this group formalized. They became an association and fought hard to keep their spot in the park when they got swept up in Bloomberg’s licensing frenzy of the late 1990s. 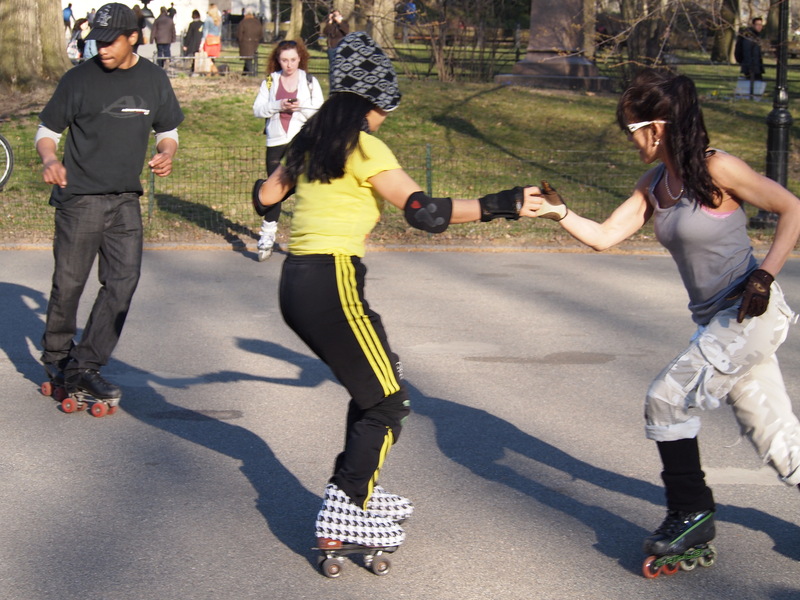 They won, and the CPDSA now holds three permits for every meet: A monthly Special Events Permit, which comes with the ubiquitous metal barricades and gives the skaters their stage – just south-west of the Bethesda Fountain, off the 72nd Street transverse. 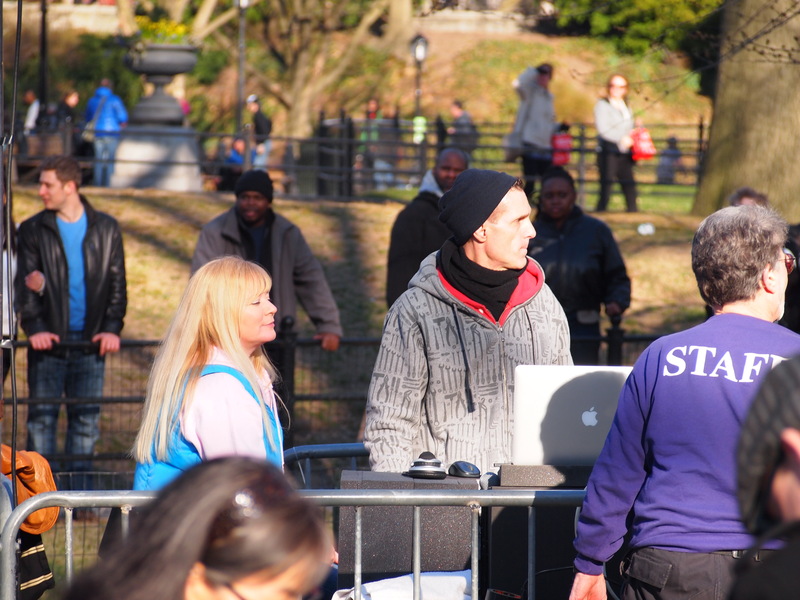 A weekly, $50 Amplified Sound Permit, which allows for djs like Saturday’s DJ-e, who didn’t miss a beat. And a TUI, a Temporary Use Permit that allows the group to fundraise for the former two. Rob had it all in hand. 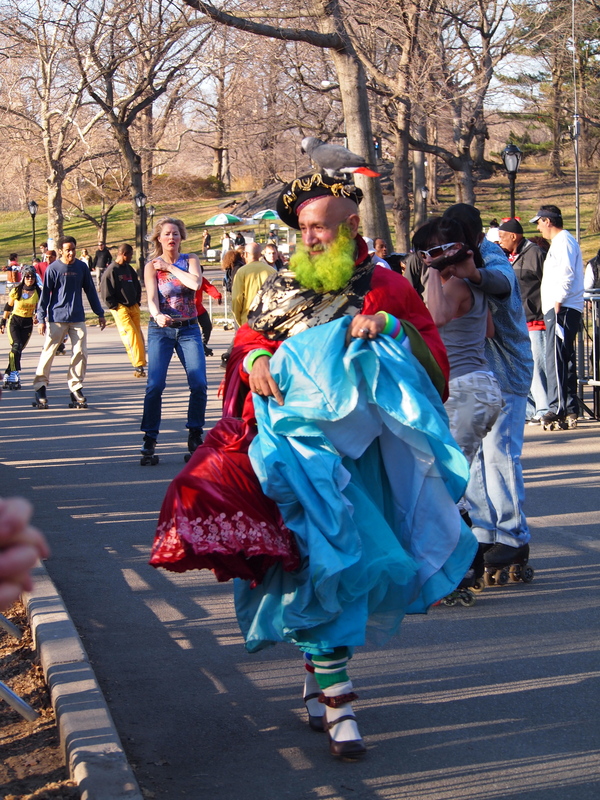 The dancers, skaters, onlookers perched on the rocks above the pop-up rink and the hula-hoopers… all had a ball. 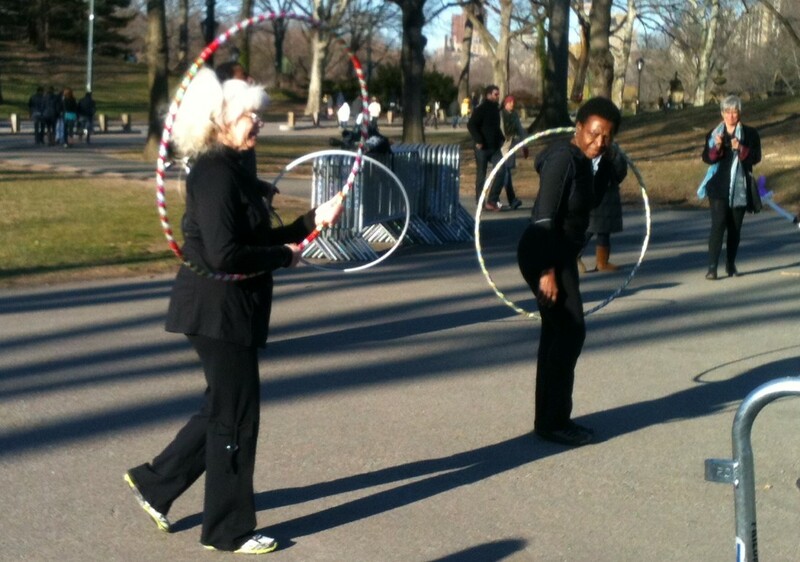 Music flow: Joan Warburton showed onlookers how to keep hoop maneuvers in time with the music. Whether you dance, roll, dress up or just need something to put a spring in your step, stop by for a dose of amplified sound and color. Dances are held every Saturday and Sunday and public holiday Monday over summer. 2:45 to 6:45.